SSI Aeration has a team of trained technicians who are available to travel to job sites around the world. Having one of our technicians on site ensures correct installation and worry-free performance over the longest period possible. SSI Aeration has teams available to install aeration systems and can be on site as soon as the basins are cleared and ready for install. Using SSI’s installation services provides a quick and headache free installation for the owner. SSI Aeration has provided labor for projects ranging from membrane replacement and retrofitting to installing a new aeration system including piping and supports. Using an extensive check-list SSI start up technicians will go over and review installation on site and can flag potential issues before basins are filled. Our on-site team will work with the contractor to correct and remedy any imperfections before signing off on the installation. 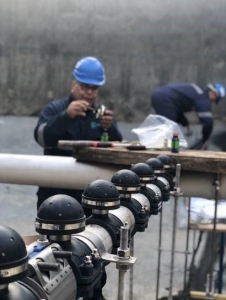 After the start-up technicians can train staff on site for proper installation and maintenance of the system leaving your team with the knowledge and skills to run the plant at peak efficiency for years to come. Services can be provided as a package with a new system or as a refresher course to a current installation. SSI’s technicians are available around the world allowing us to offer a fast response times and someone who can speak your language. To learn more about SSI’s site services please contact our office directly for a custom quote.